The RN Championship was run during the Inter-Service Championships held at the 2012 Olympic sailing venue, the Weymouth and Portland Sailing Academy. The Championships were held over two days of strong 20-24 knot winds and sunshine and involved slalom racing across the wind, with sailors up on the plane and carve gybing at the marks. Competition was close, with Tom, Paul Morris and Adrian Wallis battling it out while contending with the RAF and Army top sailors who had an eye on the Inter-Services team competition. There were seven races completed on the first day and three on the second day and Tom Eskdale and Paul Morris finished on equal points, with Tom clinching the title on most races won. 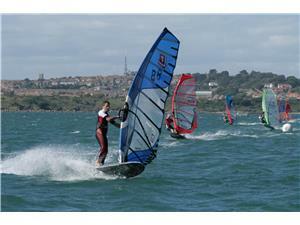 Congratulations to Tom Eskdale, RN Windsurfing Champion of the Year! Picture: Tom Eskdale leading Paul Morris and Simon Kent (RAF) into the second gybe. The RNSA Windsurfing Team won the Inter-Services Windsurfing Team Championships at WPNSA Portland on Fri 11 Sep 15 For the first time since 2007, the Royal Navy are the Inter-Services ..